The E-Tron offers a range of 250 miles. 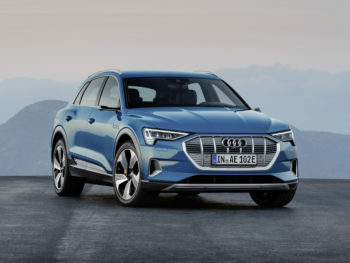 The carmaker has now said it marks the first of many fully electric models to bear the Audi logo, with plans to launch electric drive in all key market segments, making up a third of its sales and covering Avant and Sportback models as well as SUVs including the E-Tron Sportback too, helped by four technical platforms. Audi also said it would significantly expand its range of plug-in hybrids. Revealed in San Francisco, the brand’s first all-electric model offers a range of 250 miles and can regain most of that range in around 30 minutes using a high-power 150kW on-board charger. It will also be backed up by Audi’s newly announced charging service, which will bring access to more than 72,000 charging points. The E-Tron paves the way for its full electric plans. Available in the UK from early 2019 with pricing to be in the region of £70,805, it brings space for five passengers, along with a total luggage capacity of 660 litres. Two electric motors bring a total a system output of up to 300 kW and 490lb.ft of torque, giving a 0-62mph time of 5.7 seconds and an electronically-limited top speed of 124mph. Specification details for the UK are yet to be confirmed but equipment on offer will include the high-end MMI navigation plus media centre, including LTE Advanced and Wi-Fi hotspot, adaptive cruise assist, and an efficiency assist that uses radar sensors, camera images, navigation data and Car-to-X information to detect the traffic environment and the route, and give economy tips to the driver, as well as braking and accelerating predictively.